The intense crunch of the bread is tearing the skin off the roof of my mouth, each bite a small exercise in pain. It hurts, but it's a good hurt, because it's being chased by morsels of Italian sausage, well-heeled in spice, glimmers of fennel seed, with peppers, pickles and mayo to close out the show. It's one of the sandwich offerings at Big Lou's Butcher Shop, opened up by the same folks behind Two Chefs and a Table, just a block away. This is a temple of meat, harkening back to the days before big box grocery shopping. A wood cash register sits on the counter, an old tube radio behind, and soda crates on the shelves up top, all echoes of yesteryear, or so it seems: the crates are from Boylans, an iPod dock sits beside the radio, and I'm assuming the cash register is at least refurbished. Similarly, the meats are from Polderside, Sloping Hills and other regional producers: old practices, new contexts. It's the type of place that Meatpaper subscribers should flock to. Each sandwich is, unsurprisingly and unflinchlingly, about meat. It's like the shop itself is being sold in small (or, in the case of these sandwiches, huge) packages, embodied between two pieces of bread. A roast beef sandwich ($12) pulls no punches. There is but one star, and it has been made in-house, seasoned with red wine, and served medium rare. The pickles and mayo that it is served with almost seem unnecessary: balance is overrated, and we're jumping off into the deep end here. The porchetta sandwich ($9) toes the same line. It revels in all things porcine with bold emphasis, almost gamy, though the focus has swayed too far from the crackling, whose diminished presence is severely missed. The chimmichurri sauce that it is decorated with has enough bite to distract, but it can't make up for that absence. 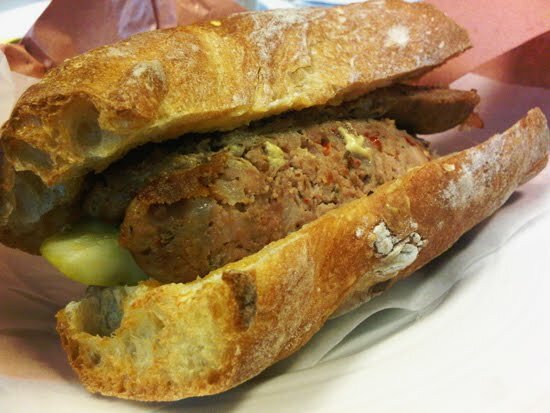 (The same type of oversight also detracts from the Italian sausage ($7.50), which can be overly arid for some.) Big Lou's devotion to the flesh might be admirable to some, but it might end up as being too singular of mind for others. Then again, it is a butcher shop. Of course, sandwiches aren't the only focus at Big Lou's, and it'd be a mistake to judge the place on the lunch it offers alone. While we couldn't quite review all the roasts, steaks and chops offered at the store, we did pick up a half-dozen of the housemade meatballs (it worked out to be about $4 for 6), in keeping with our recent obsessions. Big Lou's makes them entirely with beef, and well-seasoned with diced peppers and fennel seed in the mix. They're a dense affair, emphatic on the meat (as with their sandwiches), and not quite as light and fluffy as they could be. We browned and braised them in the oven, in the same vein as A16 does theirs, and when served in smaller portions and just a smidgen of pasta, they make for a good dinner. I'll have to get myself there this week. What was your fav item that you tried? How was the porchetta when compared to M&B? I knew someone was going to compare it to Meat and Bread, and so I didn't want to go there in the review, since Big Lou's is a butcher shop that happens to serve sandwiches, rather than the other way around. Guess I couldn't avoid it! Meat and Bread's porchetta is better: it's better seasoned, you get more crackling (which alone puts it over), and their bread stands up better. But let us know what you think! 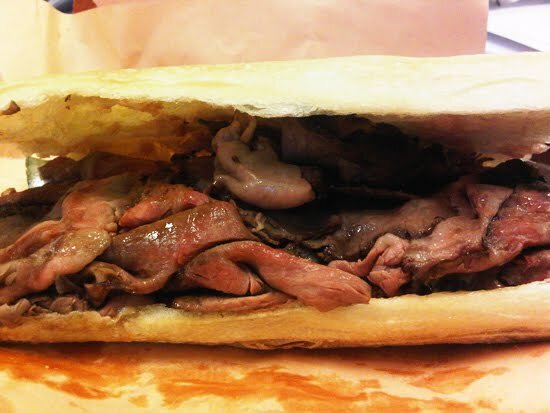 Had the roast beef sandwich today: solid, but not mind blowing. Beef was sliced rather too thick so that lots was pulled out with each bite. Not bad value for the price. Have to say though, the best deli sandwich in Vancouver is still at the Cardero Bottega.